A RwandAir's B737 at Lagos airport. According to the RwandAir Country Manager Nigeria, Hafeez Balogun, RwandAir could start a daily service from Kigali (Rwanda) to Lagos, from October 2012. The airline serves Lagos, three times a week. The airline recorded a high load factor, since the first flight in December 2011. More over, RwandAir is the "official" airline for the Nigeria Football Federation, when Nigerians Football Teams play in East Africa. 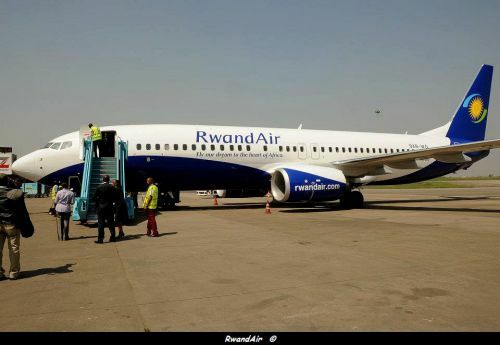 To celebrate the 1st anniversary of the airline in the Nigerian market, RwandAir has launched an exciting promotion, that will see clients who purchase tickets on RwandAir win fabulous prizes in a grand draw that will be held in the 1st week of December 2012. For every ticket purchased from Lagos to Johannesburg, the client will qualify to enter into the grand draw where he or she stands a chance to win one of the prizes on offer. The 1st prize is a brand new Rio Saloon Car, 2nd prize is a family holiday for 4 in business class and 3 nights’ hotel accommodation in Johannesburg, and the 3rd prize is Economy class ticket for 2 with 2 nights’ accommodation in Johannesburg. In addition to the grand prizes, the clients will be entitled to enter the weekly draws where they will win prizes of tickets to RwandAir’s entire network that include Kigali, Entebbe, Nairobi, Mombasa, Dubai, Dar Es Salaam, Kilimanjaro, Mwanza, Kamembe and Gisenyi on Lake Kivu. 3 clients will certainly hit a double jackpot in December at the grand draw!